So here we go! It is so exciting to think that after so many years the Nitecaps get to do it one more time! Yes, on September 1, 2018 the Nitecaps Reunion is happening! None of us would have ever looked to a future date like this when we were all playing together so many years ago, and the thought that we are going to fill a room with so many friends and people who remember our band and would actually come out to share a night of music with us is such a blessing. It just can’t get any better. We are going to play only songs from the Wutzit days, but I know everyone coming will recognize every song we play from our Nitecap song list. These are the same songs that we all danced to back in our Wutzit days and we can’t wait to play them! The band will have many Nitecaps original members of the band, but unfortunately, over the years, some of our members have left the planet. Of course, they will be there will be there in sprit, but we do have a special surprise in store – we will also be featuring original members from the Barons of Soul to fill in for those not with us. I have been sharing the stories of both the guys that will be playing as well as the guys who have passed on Facebook, and of course, this site has wonderful details of each and every member of all eras of the Nitecaps. Singing the old songs and reminiscing with all of the guys since we have been practicing for this event has been so uplifting and fun I just can’t put in words. 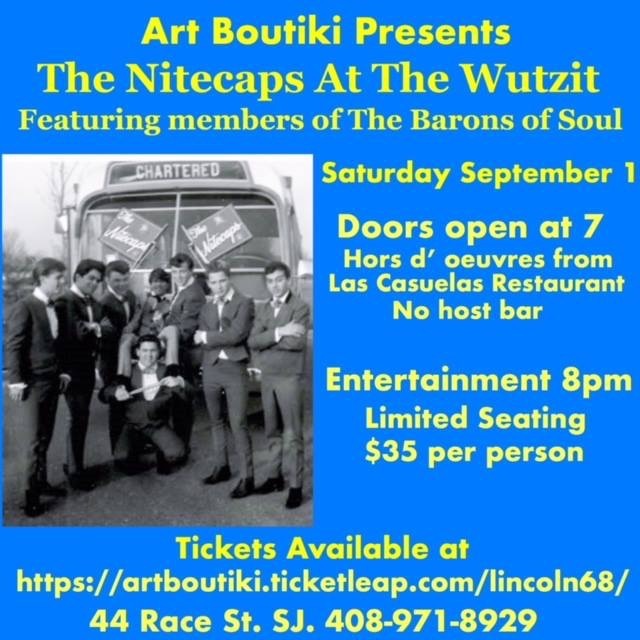 I look forward to not only singing but also sharing some stories about the quys in the band and the important people who made the Wutzit club what it was. I just know that all of us will leave the show with warmed hearts and smiles from sharing the memories of the people and the music of the those great days.